On January 8, 2018, the Parmer County Sheriff’s Office received a report of a burglary of some barns northwest of Friona in a rural area. Force was used to break into these barns and numerous items were taken including building materials, rolls of copper wire, metal roofing, 2-inch aluminum pipe and an antique compressor. 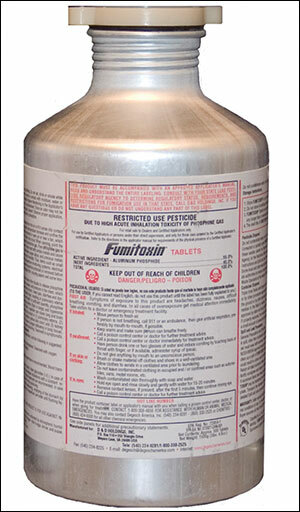 Also taken in this burglary were six canisters of aluminum phosphate labeled “Fumitoxin”. Aluminum phosphate is a powerful agricultural pesticide, which is not intended for use by the general public. This is a controlled substance and is deadly to pets and humans. This pesticide is the same chemical that was involved in Amarillo, which resulted in the deaths of four children in early 2017. The aluminum canisters are approximately half-gallon size. They are sealed with a plastic screw cap with a rubber gasket. The canisters contain 500 tablets or pellets. The canisters should be labeled with the name “Fumitoxin” and has the skull and crossbones image, which is recognized as poison. The containers are old and the labels may be in a degraded state and or missing from the containers. If you are in possession of these canisters, do not open, do not get the product wet and do not open in a closed area. This product must be handled by trained persons. Anyone with information leading to the arrest of persons involved in the burglaries may contact the Parmer County Crime Stoppers at (806) 481-9178. You may be eligible for a reward. If you are in possession of these canisters, you may anonymously leave them at a local fire station.